We're a Community of "ALL"
All are welcome. All may share during worship. All may participate in decisions. All may contribute to creating and sustaining our accepting, loving community. All may speak during worship. All may participate in decisions. The Five Testimonies are our Values. We’re probably most known for our commitment to Peace. Quakers take an active approach to Peacemaking through nonviolence training, conflict resolution practices, and work on national legislation. Quakers appreciate a life that leans toward simplicity. We find that a simple life is one that can focus on what is truly important. Quakers are known for their social justice work. Early Quakers were Suffragists and Abolitionists. Quakers today are committed to ending racism and working for immigration reform. Telling the truth to ourselves and to others is considered key to spiritual growth. In order to truly hear and follow the leadings of Spirit, we must be willing to hear and act on the truth. We value community. Our doors are open to all. We see ourselves as connected to the earth. We respect the planet and all its inhabitants. Quakers take an active approach to Peacemaking through nonviolence training, conflict resolution practices, and work on national legislation. Quakers appreciate a life that leans toward simplicity so that we can focus on what is truly important. Quakers have always worked for social justice and civil rights. Gender equality has been a hallmark of Quaker life – many Suffragists were Quakers. Telling the truth to ourselves and to others is considered key to spiritual growth and the ability to hear and follow the leadings of the Spirit. We value community. Our doors are open. We’re connected to the earth and respect the planet and all its inhabitants. What the heck do Quakers do during worship? Do Quakers have strict beliefs? What are they? Why don't you have a minister? We believe that each of us can have a direct experience of God or Spirit and that we minister to each other. The Amesbury Quaker Meeting is an “unprogrammed” meeting. We don’t have a pastor as we don’t feel the need for the guidance of one primary person for a meaningful spiritual practice. Members rotate through the roles required to manage our organization. Learn more about the role of the Clerk of Meeting and the Clerks of each committee. So you all are Amish? No, we’re not Amish. We’re not sure why there is often this confusion other than the fact that people think of the Quaker Oats guy when they hear “Quaker” and they associate his “look” with ways of the Amish. While Quakers and the Amish are both traditional “peace churches,” the Amish are known for their conservative beliefs and reluctance to accept modern technology. Quakers, on the other hand, are known for more progressive views and an openness to change. And to set the record straight, we have nothing to do with oats. The Quaker Oats company selected the Quaker name as a symbol of good quality and honest value. That’s been our brand for over 300 years, and we still maintain that reputation of integrity. We’ve answered a few questions, but you likely have more. Hover over any of the events or click to go to that event page with full details. 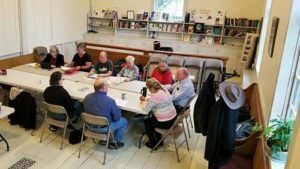 Our monthly gathering for spiritual nurturance, Quaker education and exploring the needs of our unique community at the Amesbury Friends Meeting. Facilitated reflective discussions on Quakerism topics, presentations of individual Spiritual Journeys, and more. We've got plenty to celebrate! Yes, we’re troubled by the injustices in the world and we do our part individually and together to work for change. And we are grateful for the community we’ve created – one that’s filled with love and sometimes challenges. A community that embraces all – individuals, couples, families. We have each other…and that’s what matters. Yes, we’re troubled by the injustices in the world and we do our part to work for change. And we are grateful for the community we’ve created – one filled with love and sometimes challenges. A community that embraces all – individuals, couples, families. This video tells the fascinating story of the connection between John Greenleaf Whittier and Amesbury Friends Meeting. Whittier was a member of our meeting and Clerk of the Building Committee that oversaw the construction of our current meetinghouse in 1851. Whittier’s work as a poet and abolitionist was strongly influenced by his Quaker faith and commitment to Quaker principles. As part of the 350th Birthday Celebration of Amesbury, Massachusetts, there was a Tour of the Amesbury Treasures – Seventeen historic sites throughout the city. Our Meetinghouse was one of them! As well as Whittier’s home that is now the Whittier Home Museum. We were pleased to welcome hundreds of visitors on May 27, 2018, share the history of our Meetinghouse and answer questions about the spiritual life of Quakers. How Have We Carried On for Over 300 Years? Your contribution helps sustain our Meeting and the Amesbury Peace Center! In 1877 “Quaker Oats” was registered as the first breakfast cereal trademark with the U.S. Patent Office as “a figure of a man in ‘Quaker garb. '” Company owners Henry Seymour and William Heston stated that they selected the Quaker name as a symbol of good quality and honest value. In 1877 “Quaker Oats” was registered with the U.S. Patent Office as “a figure of a man in ‘Quaker garb. '” Company owners stated that they selected the Quaker name as a symbol of good quality and honest value. We're Here Every Sunday 10am - You're Invited to Join Us! We're Here Every Sunday 10am - Join Us!